Eric Hobsbawm was often described as the greatest living Marxist historian; now that he too is part of history, it may be appropriate to explore the relationship of his historical writings to his Marxism. The late Eric Hobsbawm was often described as the greatest living Marxist historian; now that he too is part of history, it may be appropriate to explore the relationship of his historical writings to his Marxism. Some of his right-wing critics, like Michael Burleigh, argue that Hobsbawm’s historical work must be rejected because of his support for the USSR and the other Stalinist states. Others, like Niall Ferguson, are aware that books such as The Age of Empire cannot simply be dismissed on a prioripolitical grounds, but nevertheless treat his work as quite unrelated to his Marxist theory of history: from this perspective Hobsbawm may have held dangerous and objectionable views, but as a professional historian he did not, at least until his final works, allow these to seriously influence his analysis. Hobsbawm himself always argued that his historiography was inseparable from his Marxism and, indeed, was only made possible by it. I think that he was right in this judgement. For those of us on the anti-Stalinist left Hobsbawm’s orthodox Communism meant that his political judgements—his extraordinarily narrow conception of the working class, for example, or his belief that nationalism could be harnessed for progressive ends—had to be treated with deep suspicion; but much of his historical writing has to be afforded a great deal more respect. For his major works were never confined by the mechanical formulae of Stalinist orthodoxy, which may explain why—as Hobsbawm noted with evident pique more than once—his books were not translated into Russian nor, Hungarian and Slovenian apart, into the majority of the other Eastern European languages until after the fall of the Berlin Wall. In fact, it is one of the paradoxes of his career that, the legacy of Stalinism notwithstanding, Hobsbawm remained more aligned with the classical Marxist tradition than, for example, Edward Thompson, who shared his formative Communist background. Thompson in fact makes an interesting comparison. It is not necessary to be a Marxist to produce important historical work, of course, as the names Bloch, Braudel or Ginzburg testify, and this is also the case with Thompson. Although his work was explicitly informed by a socialist identification with the oppressed and exploited there is little distinctively Marxist about his theoretical framework, even in The Making of the English Working Class. This is frustrating, because “The Peculiarities of the English”, one of the few works where he did attempt to marry his own deep historical knowledge with an explicit Marxist theoretical position, is one of the greatest historical essays written in Britain since the Second World War. Thompson’s individual talents took him very far without a firm theoretical basis but, given the absence of those talents among most of his followers (Peter Linebaugh is the main exception), his influence has been catastrophic. Unlike Thompson, Hobsbawm refused to abandon his membership of the CPGB after 1956. This decision can be politically criticised on a number of levels, but it was accompanied, in his case, by the retention of some of the fundamental Marxist propositions which Thompson came to dismiss. It is sometimes argued that Hobsbawm’s classicism is primarily demonstrated by adherence to the base-superstructure metaphor. It would be more accurate to say that, while Hobsbawm accepted that the relationship between the social organisation of production and other aspects of human life which is encapsulated in the metaphor is the necessary starting point for understanding history, he never regarded it as a substitute for doing so. The format of the individual volumes in his quartet on the history of capitalism may appear superficially comparable to those conventional historical surveys which conclude with perfunctory chapters on culture or the arts, the leftovers which can be dealt with once more important economic and political matters have been dealt with. In fact, Hobsbawm did something quite different: consciously structuring his work to ascend from those aspects of human life most immediately involved in the material reproduction of society to those concerned with its ideological representation, and these different moments are not autonomous from each other but linked through a series of mediations. Indeed, what distinguished Hobsbawm as a Marxist historian was his insistence—usually implicit, since he rarely engaged in theoretical muscle-flexing in his substantive works—that capitalism forms a totality which is ever present no matter how microscopic the aspect which the historian may subject to scrutiny. This insistence on totality manifests itself in his work in several ways. The first is in relation to the divisions imposed by modern academic disciplines. As Hobsbawm pointed out on several occasions, these are artificial, arbitrary and encourage an understanding of the world which is fragmentary and incoherent. The fact that Marxist intellectuals regularly ignore these problems is at least partly due to the fact that since the Second World War they—or perhaps I should say, we—have operated largely in a context where identification with a specific discipline is virtually a condition of employment, ritual genuflections towards multi- or inter-disciplinarity notwithstanding. Marx himself may have emphasised certain aspects of the social world rather than others, but the latter are, as it were, merely offstage for the duration, their presence still felt in the action, not relegated to a different performance altogether. Hobsbawm adhered to this approach. It is difficult, reading his books and essays, to say at which point the historian has given way to the anthropologist (Primitive Rebels), the historical sociologist (“Revolution”), the social geographer (“Labour in the Great City”) or the cultural critic (Behind the Times). The second is more substantive. Hobsbawm recognised that, since capitalism emerged as a distinct mode of production—which for him seems to have been signalled by the crisis of the seventeenth century—it has been international in character. Hobsbawm had very little time for Trotsky or his ideas, so there is a certain irony in the fact that his historical work has always been guided by a perspective similar to that of the latter, which treated capitalist world economy, not simply as the sum total of its individual component nation-states, but possessing an influential existence in its own right. One of the pleasures of reading the Age quartet in sequence is the way in which the reader can follow the expanding geographical boundaries of capitalism as the project unfolds, from the essentially European setting of The Age of Revolution through to the truly global reach of Age of Extremes. The third and similarly substantive aspect of his work is his recognition that the lives of the exploited and oppressed cannot be understood in isolation from those of the people who are exploiting and oppressing them. This may seem obvious, but even though Hobsbawm is rightly regarded with George Rudé as one of the founders of “history from below” his work never involved the kind of social history which is concerned simply with exploring the texture of everyday experience. Endless repetition of Thompson’s expressed desire to “rescue the poor stockinger, the Luddite cropper, the ‘obsolete’ hand-loom weaver, the ‘utopian’ artisan, and even the deluded follower of Joanna Southcott from the enormous condescension of posterity” has obscured the fact that, in hands other than those of Thompson or similarly committed writers, there is nothing specifically Marxist or even necessarily left-wing about this approach. Indeed, it can often simply involve a kind of microscopic antiquarianism. Hobsbawm was never interested in this kind of history from below, but focussed instead on actual movements—no matter how apparently eccentric or removed from the mainstream of labour history—such as the millenarian sects and social bandits he investigated in the 1950s and 1960s. And he never regarded these movements in isolation, but in relation to the social forces to which they were opposed: for Hobsbawm, totality necessarily involved history from above, as much as from below, even if it is the subjects of the latter which claim our retrospective sympathy or solidarity. But if Hobsbawm treated capitalism as a totality, he effectively abandoned this position in relation to what he took to be socialism. Hobsbawm latterly lamented the way in which the Stalinist states had concentrated on economic transformation at the expense of developing forms of political representation, so that in the end the mass of the people either participated in revolutions against the states from which had been excluded, or at least refused to defend them. The echoes of structural Marxism are very strong here and, while I am not accusing Hobsbawm of sympathy for Althusser, a thinker for whom he always rightly displayed a healthy scepticism, there is a point of comparison. For anyone who wishes to argue that the Stalinist states were based on a socialist economic base while simultaneously criticising their lack of democracy is effectively forced to retreat into a non-Marxist pluralism in which any sense of mediated totality has been abandoned. By the late 1920s in the case of Russia, and from the very beginning in the case of the other Stalinist regimes, civil society was indeed brought into line with the economic structure: lack of democracy was not an aberration or an residue, it was the necessary condition for accumulation and industrialisation to take place under conditions of bureaucratic state capitalism. There were times when Hobsbawm came close to accepting this, particularly in the interviews he gave directly after the fall of the USSR, in which he accepted that there is nothing intrinsically socialist about state planning and ownership. Yet this acknowledgement has not affected the sense of loss which Hobsbawm expressed on several occasions for the collapse of the Russian anti-workers’ state. This seems to be not so much because of what Hobsbawm thought the Soviet Union was, but because of what he believed that it did, above all to contribute to the victory over fascism. The moment of Hobsbawm’s own historical and political formation was not so much the Russian Revolution itself—he was born in 1917 between the February and October Revolutions—but the strategy of the Popular Front against Fascism and War, adopted by the regime in 1935 and, the period of the Nazi-Soviet Pact aside, which became the default position of Stalinist parties thereafter. Adherence to the politics of the Popular Front was a constant in Hobsbawm’s politics—as it was for Thompson and the other former members of the CPGB Historians Group. It is difficult for those born afterwards to fully appreciate, for many of those becoming socialists at that time, just how deeply the Stalinist tactics of the period became a touchstone for politics as such, almost a form of Gramscian ‘common sense’. 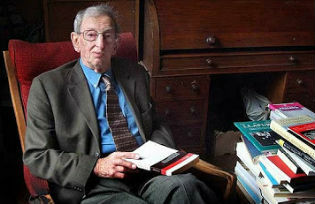 There is no space here to recount the devastation which Popular Frontism caused for socialist politics in the twentieth century; but if there is any respect in which Hobsbawm’s politics impacted negatively on his work as a historian it is surely the extent to which he was unable to detach his support for this strategy from his analysis. It is held in check for most of the quartet, although there are early intimations of its distorting effect in the chapter on the French Revolution in the first volume, where he argues that the cross-class alliance led by the Jacobins was a model for all subsequent revolutions. By the last volume, however, Hobsbawm’s enthusiasm for the Popular Front completely unbalances his account of the “long twentieth century”, as it claims an entire celebratory chapter while the Russian Revolution itself is dealt with in a handful of downbeat pages, the main burden of which is that it was doomed to fail. Now that his life is over and his body of work complete, it is only fair to Hobsbawm that his critical admirers take time to assess his output as a whole, free from the demands of instant assessment required by obituaries. I am confident, however, that relatively little of his serious historical output is irredeemably tainted by the political tradition to which he belonged; most of is a lasting contribution, not only to the culture of the left, but far beyond it. And can those critics of the right who endlessly demanded that he recant the views which informed his entire life and work point to any historians with their beliefs who entered the public consciousness to anything like the same degree? Neil Davidson teaches sociology at the University of Strathclyde. He is the author of ‘The Origins of Scottish Nationhood’ (2000) and ‘Discovering the Scottish Revolution’ (2003), for which he was awarded the Deutscher Memorial Prize and the Fletcher of Saltoun award. His most recent book is ‘How Revolutionary Were the Bourgeois Revolutions?‘ (2012). I am not suggesting that continued membership of the CPGB was necessary for this: Rodney Hilton and John Saville continued to produce important Marxist work after leaving, and two of the most important British Marxist historians, Geoffrey de Ste Croix and Brian Manning, were never members. In Hobsbawm’s case, however, the two things seem to have been linked.